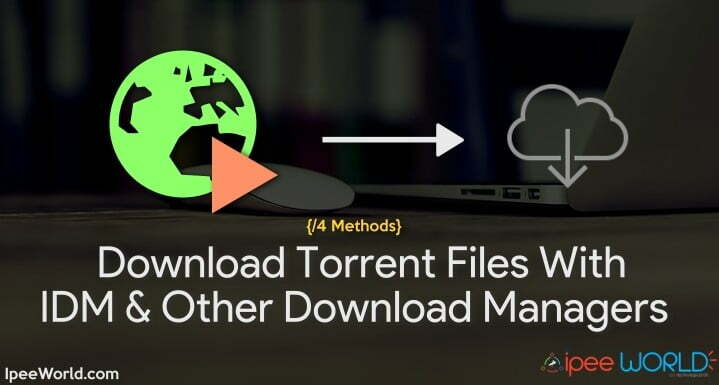 Torrent To IDM Trick – Today in this trick I will show you how to download a torrent file with IDM We regularly use the Internet for downloading various files from different websites. A majority of us will be using Torrent for downloading heavy files. Most of us find it easy to download files with Torrent Downloaders. We are using the Torrent to IDM trick to download Torrents using IDM.But still, there are people who hate to use Torrent Downloaders for many reasons.This article will be great for such torrent haters.You will find How to Download Files from Torrent through IDM or any other similar Download Managers. Almost all of the below-mentioned Sites are Completely and Partially Free. That means, to download files which less than the size of 2GB, the Free plan will be quite enough for you. But, if you want to Download files that are more than 2 or 4GB in size, you should go with their Premium Plans with great features that Free version does not offer. IDM or Internet Download Manager and other Download Managers can be used for downloading torrent files without any Torrent clients.Do remember Download Managers alone can’t participate in this process So, we need an intermediator for getting this work done.Below I am sharing top working and most used websites for downloading torrent files with IDM. So, let’s see which are those websites. If you are struggling to find a good reliable source of Torrent files, then you should definitely have a check on the Best Torrent Sites list, this list contains all major Torrent websites that are in 100% working condition, safe and secure. In short, the services mentioned below can also be called as IDM Torrent clients as well. Here are the few among Best Torrent to IDM Downloader. Go through each and every service and find one that suits you the best. I must include Seedr.cc to the top of the list for a variety of reasons. Most of the websites used to download Torrent Files with IDM has a certain restriction or is paid, That’s exactly where Seedr.cc to help us. Seedr has both Free as well as Paid plan. For a moderate user, the Free Plan will be very enough. The Free plan gives you about 2GB of Storage data, which you can use to download Torrent files with any download managers. I am using Seedr from a long time and all I can say is that it is the best Torrent to IDM service you can use. 2. Sign up for a new account. You can use Google or Facebook to log in as well. 4. Copy the Magnet Link/ Torrent Link or Download the Torrent Files of the file you want to download. 5. Now go to Seedr.cc and either paste the Magnet/Torrent Link or upload the .torrent file. 7. Click on the Download button to Download the file to your Computer or copy the link address and paste it into IDM. OffCloud is another Torrent to IDM Downloader which has a Free option. The free version of Offcloud gives us 10GB of storage which can be used to Download files. The user interface and services provided by Offcloud is pretty awesome. You can download the Torrent file by adding Magnet/Torrent Link or .torrent file. Offcloud is really good in grabbing torrent files from all seeders and downloading it to your computer via IDM. One of the best Torrent to IDM Service with a great lot of features and functionalities. Apart from Torrent, Offcloud supports number of other File Sharing sites as well. 3. On the dashboard, you will see a box to enter the link of Torrent file or upload the .torrent file. 5. Click on the download button. 7. Now click on the Download button to download and save the file to your Computer. You can use your Browser Downloader, IDM or any other Download Managers to download the file. ZBIGZ is one of the popular Torrent to Direct Download website with thousand of users. They do have both Paid as well as Free plan. Free Plan will be very enough for us. The free plan itself will be having all the feature we need. 4. Click on the Download button, within a few second the file will be downloaded to ZBGIZ’s server. 5. After that, click on the Download button to download the file to your computer. Boxopus is one among the fast and easiest online torrent downloader to download pretty much any Torrent Files with IDM. Boxopus is available on all major platform including Windows, Android, iOS, and macOS. Boxopus is another Torrent to Direct download website. All the functions are very much similar to that of the others. It also has an option to save the file to your Dropbox account as well. With Boxopus, you can download torrent files to your own computer or to any cloud service of your choice. 3. Paste the Torrent/ Magnet Link or upload the .torrent file. 4. Wait until Boxpus cache your file into their server. 5. Now you will see Direct Download button by which you can download the file to your computer. 6. Click on the Download button to save the file to your computer. PutDrive is the last one in our list. Putdrive works similar to the other sites mentioned above. The best part about Putdrive is that other than Torrents, they work with various other File Sharing too. YouTube, Zippyshare, Mediafire, etc are some of the other sites from which we can download files with Putdrive. Putdrive is a perfect example for Multihosters to save files from different services without having the need to have an account on all these sites individually. 4. Wait for some time for the cache process. 5. Once it’s done a Direct Download link will appear. 6. Click on the Download button to download the file to your computer. These are some of the best working methods to download torrent file with idm. Internet Download Manager is undoubtedly the best Download Manager available out there. If you want to utilize the maximum bandwidth you get to download files, then Internet Download Manager can help you in getting work done. So, that’s it, guys. See How simple it was to Download Torrent files to IDM or any other similar Download Managers. Next time when you are about to download a torrent file, then use this method to get at least 3X faster Download speed. Hope you guys found this article useful. Do share this article with your friends on your favorite Social Media and let them also know about this awesome trick. Comment download below if you have any doubt.